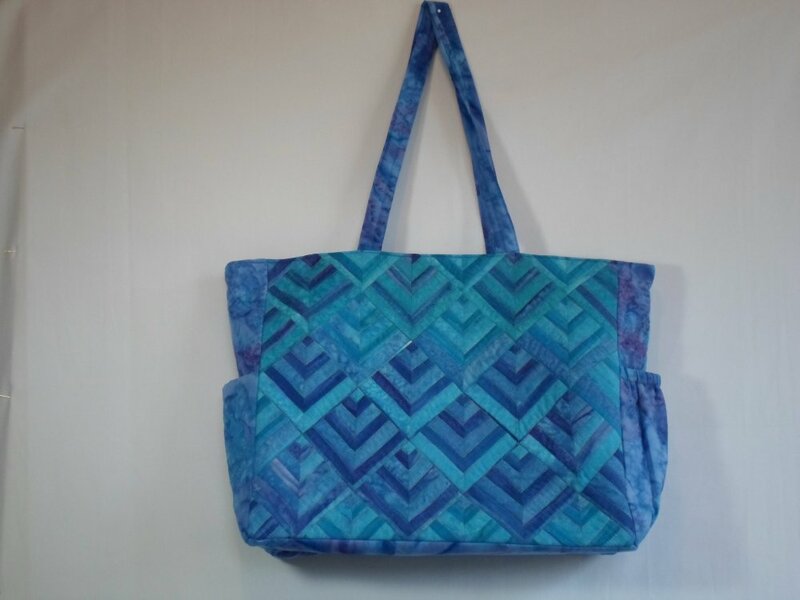 One striped fabric magically transformed into chevron blocks lights up the front of this easy 12"x15" tote bag. This is the perfect bag to take to a quilt show. It includes: over-the-shoulder straps, padded bottle holder, mini umbrella pocket, large zippered inner pouch for valuables, file pocket, cell phone pouch, outside pocket for magazine or quilt show book, and more. KIT includes pattern and fabrics for bag and lining. (Does not include notions and batting). Kits available in multiple colored stripes with coordinating fabric and lining. Kit colors: turquoise/dark blue; magenta/purple; xmas red/green/gold; dull green/dark green; brown/orange/fall colors. Quilting thread available in turquoise/blue/green or magenta/purple.